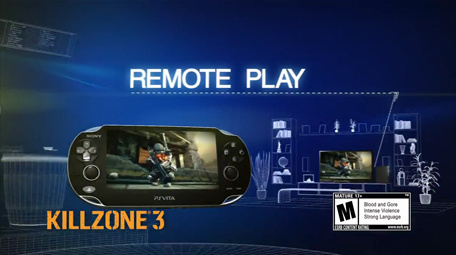 Play Killzone on-the-go with the PS Vita's remote play features. The platform holder's released a brand new trailer showing off all of the handheld's PS3 connectivity functions. The snippet shows save sharing in the Diablo-esque dungeon crawler Ruin, cross-platform multiplayer in Wipeout 2048, and even remote play with PS3 blockbuster Killzone 3. Check out the trailer after the jump, and shudder in excitement. Japan gets its hands on the device next week.